EHF Marketing GmbH, the subsidiary and marketing arm of the European Handball Federation has announced a new partner for the VELUX EHF Champions League from the start of next season. 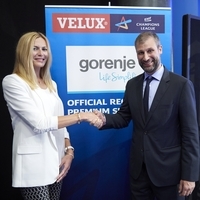 Unveiled at the VELUX EHF FINAL4 in Cologne on Sunday 4 June, the new deal sees the Slovenian company, Gorenje, become an ‘official regional premium sponsor’ of the VELUX EHF Champions League from the start of the new season and through until the end of 2019/20. Gorenje will also become an official sponsor of the Men’s EHF EURO in Croatia in 2018 and in Sweden, Austria and Norway in 2020 as a result of a separate agreement with Infront Sports & Media, the EHF’s exclusive media and marketing partner for the EHF EURO events. Through the partnership with European handball, Gorenje, the leading European home appliance manufacturer and one of Slovenia’s largest and most successful companies with more than 11,000 employees, is set to further expand its sports sponsorship activities. The company is currently general sponsor of the leading Slovenian club, Gorenje Velenje, the Slovenian Handball Federation and also the Slovenian Nordic ski team. Commenting on the agreement to sponsor the VELUX EHF Champions League, David Szlezak, EHF Marketing Managing Director, said: “Gorenje has a strong tradition of supporting top-class handball in Slovenia and I am delighted that we have convinced them to expand further onto a European level. "The VELUX EHF Champions League is the premier club handball competition in Europe and offers partners and sponsors an international communications platform to promote their brand, while at the same time offering extensive corporate hospitality opportunities. As an official event partner at this year’s VELUX EHF FINAL4, Gorenje, got a first taste of that we have to offer and we are looking forward to developing our partnership and cooperation over the next three seasons." President and CEO of the Gorenje Group, Franjo Bobinac, said: "We are proud to be entering into this agreement with European handball as sponsor of its top club and national team competitions. This deal will allow us to achieve a number of our strategic goals and further enhance and advance the reputation and awareness of the brand across Europe, and in particular in Germany, Scandinavia, former Yugoslavia and Central and Eastern Europe. "Handball is a dynamic, fast, and entertaining ball game, which requires good team dynamics, a collective spirit, knowledge and skill, focus, creativity and a clear strategy. These are all values, which reflect those of the Gorenje brand, making handball a perfect fit for us." He continued: "The Gorenje Group sees the sponsorship as a way to reinforce its cooperation with business partners, boost sales in selected markets, and to bring its inventive and technologically refined products closer to the European public. It will allow us to target our customer base and align our activities in the VELUX EHF Champions League with our other sponsorship efforts and, just as we do with our products, create solutions that contribute to a ‘Life Simplified’." The new sponsorship deals for both the VELUX EHF Champions League and the Men’s EHF EURO events in 2018 and 2020 will see Gorenje become one the main sponsors of these events and includes branch exclusivity for the home appliance sector. Gorenje Group is a leading European home product manufacturer with 67 years of tradition. Gorenje Group operates two global brands (Gorenje and the premium brand Asko), and six local brands. Present in 90 countries around the world, it brings together 11,000 employees of 42 different nationalities, and it generates 95 per cent of its revenue in the global market. All of the Group's own manufacturing plants (in Slovenia, Serbia, and the Czech Republic) and development competence centres (in Sweden, the Netherlands, the Czech Republic, and Slovenia) are located in Europe. In its core activity of home products and services, Gorenje Group already has the status of a challenger and a trendsetter, while its vision is to become the best in the world in innovation driven by modern design.